Rose Gray and Ruth Rogers’s latest series of books is an essential addition to every kitchen. 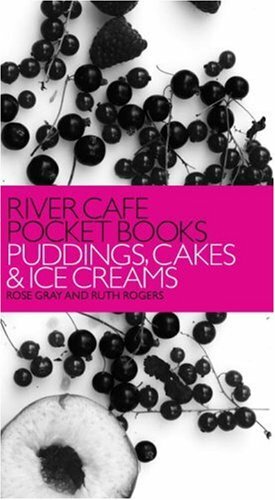 This definitive collection of pudding recipes brings together some of the best puddings from the River Cafe, beautifully packaged with a striking design by the award-winning designer of the Guardian Berliner, in a handy paperback format. Pudding is the perfect way to end a meal. A rich, indulgent chocolate cake served with a steaming espresso; a refreshing, tangy lemon sorbet or a creamy pannacotta with rhubarb. These are just some of the classically Italian choices the founders of the world famous River Cafe offer you in this mouth-watering collection of their best 100 recipes. Whether you’ve never used a River Cafe book or are a committed fan, this book makes essential reading.